Gymnastics Tasmania is committed to the safety, wellbeing, and empowerment of all children accessing our programs and services including indigenous children, those from culturally and linguistically diverse backgrounds and children and adults with disability. Gymnastics Australia is proud to present two Commitment Statements, one co-signed by the President of Gymnastics Australia, alongside the Presidents of all our member State and Territory Associations and the other co-signed by the Gymnastics Australia CEO and the Executive Directors of all State and Territory Associations including Tasmania. 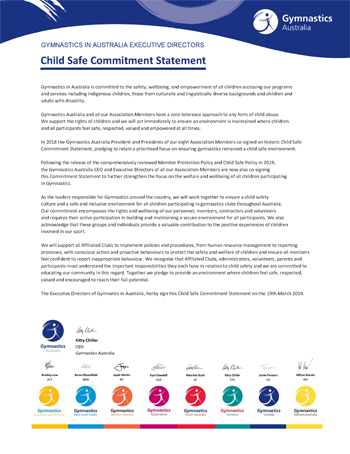 These two documents and the actions surrounding them, solidify Gymnastics Tasmania's commitment to child safety within our sport.